I recently cycled home from work on my 1950 Raleigh Sports Tourist. The bike had been sitting at my office for a while. One of the reasons I haven’t ridden it with greater frequency is that the full chain guard (“gearcase” for those who speak British) and the drive side crank arm contact each other with an annoying noise with each pedal stroke. 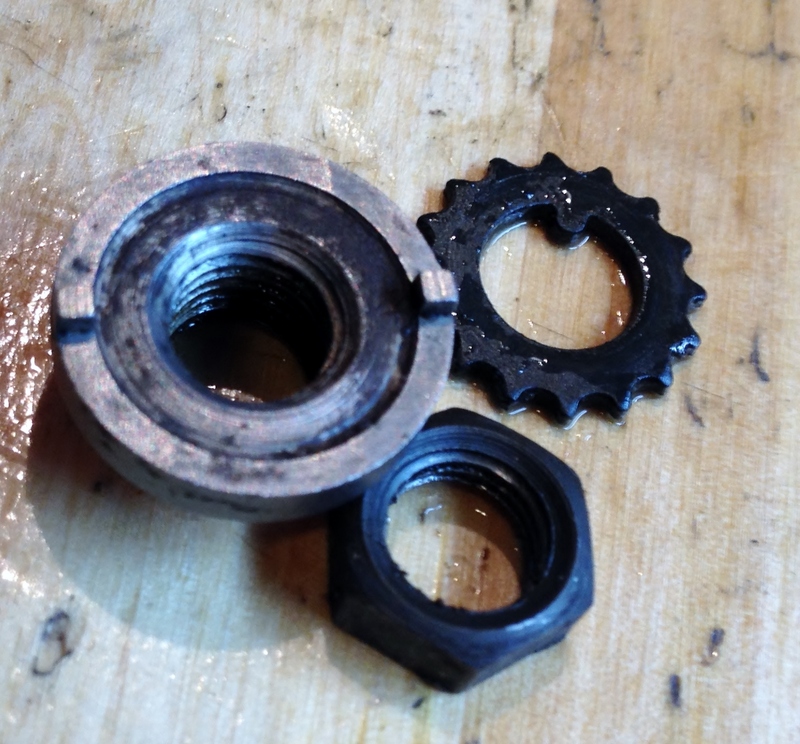 Previously, I had tried to solve this problem by mashing various parts of the gearcase with my hands to see if I could force it into a different position that would provide clearance for the crank arm. As I was noisily making my way up Clinton Street, I came upon a rider on a Mercian. We chatted for a while and I learned he was riding an early 80’s model that a friend had given him as a frame (nice gift! ), which he then built up. That’s only the 2nd Mercian I have spotted in Pdx, aside from my own. Interestingly, because my Raleigh is geared so high, I ended up surging past him in my big (but lowest) 52 gear inch as we began to climb the steeper hills, and so we parted company. When I arrived home, sans heart attack, I put the bike into the shop stand, determined to solve the gearcase/crank arm clearance problem. 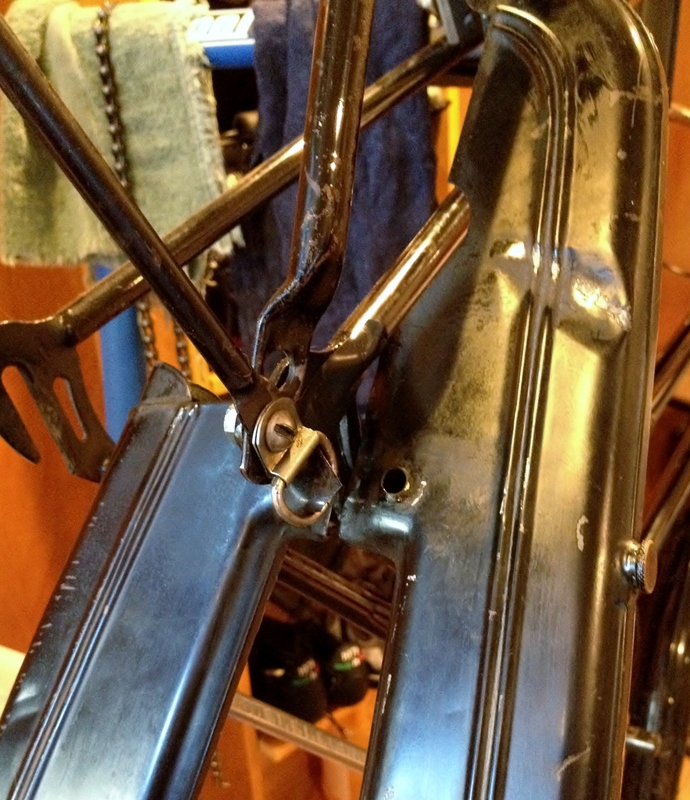 The first thing I did was to mark the position of the axle in the dropout and the adjuster on the shifter cable. This way, I could restore the wheel and cable back to their current position – something which took a while to perfect so that the hub shifts correctly. One thing I’ve gotten questions about before is how to get the gearcase off the bike. There are two pieces at the back of the gearcase which can be removed by unscrewing the bolts which attach them to the main part of the gearcase. 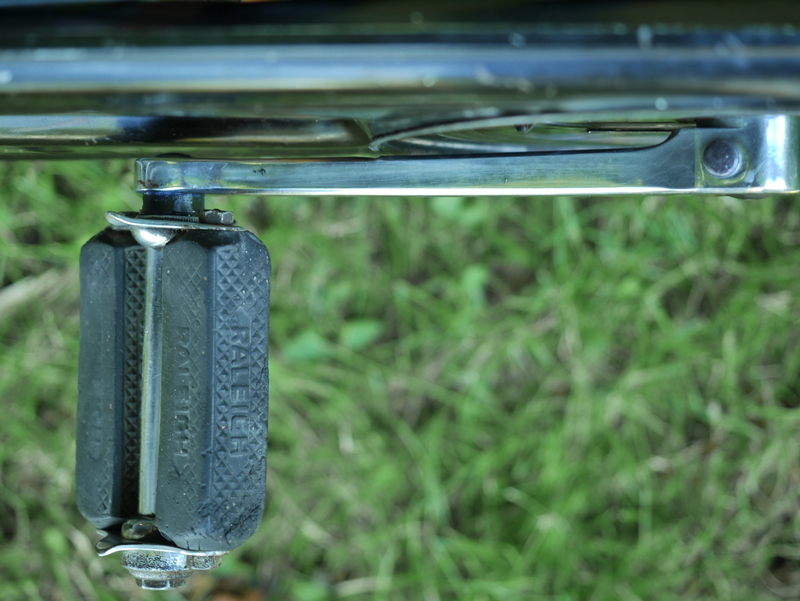 After that, there is a bracket which attaches the gearcase to the chainstay, plus a bolt which holds the front part of the gearcase, and attaches near the bottom bracket. 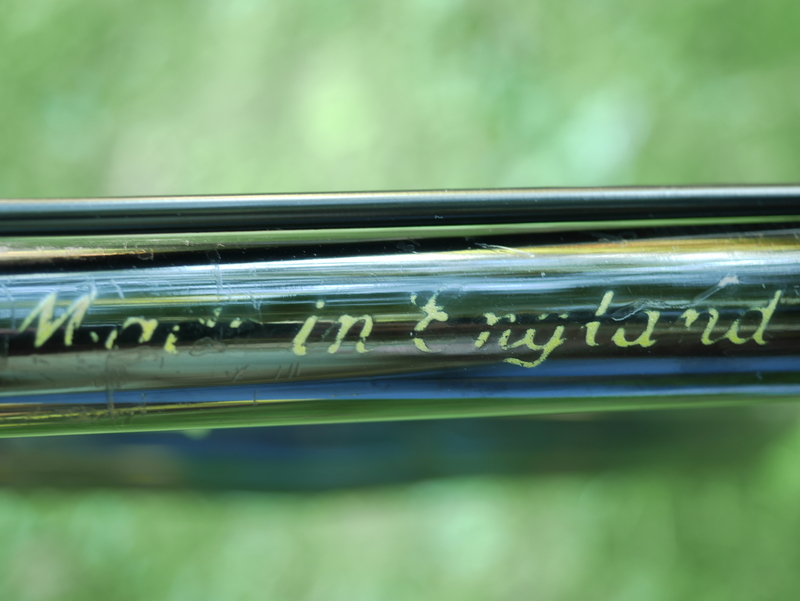 Once those are removed, then it’s a matter of re-positioning the gearcase and sliding the opening at the back through the narrowest part of the drop out. The photos above show how this is done. Once I had the gearcase off, I took my mallet to it and tried straightening it out a bit. Then, I tried various methods of altering the position of the gearcase once I re-mounted it to the frame, but nothing worked. 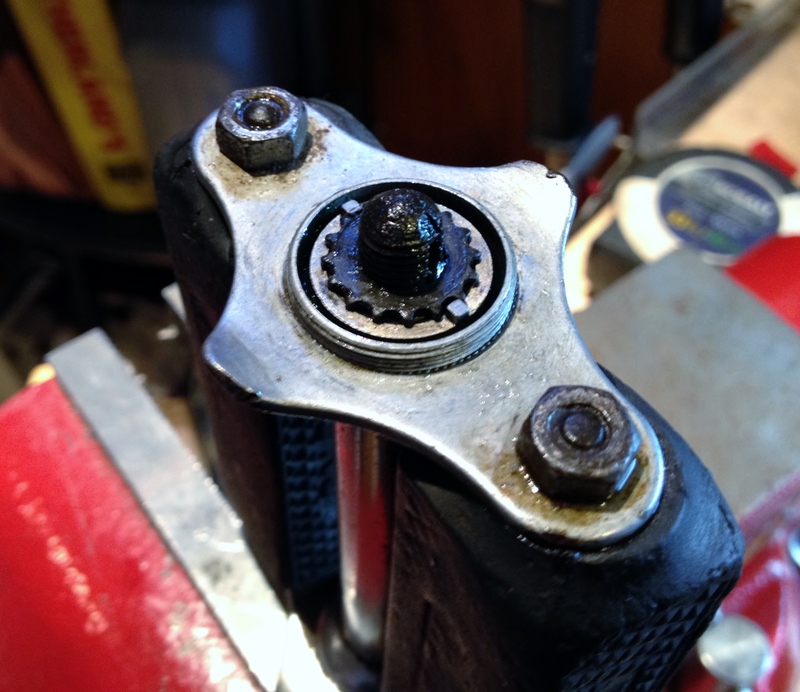 Finally, I took my files and filed away a small section of the metal on the inside of the crank arm, to provide more clearance. I didn’t want to take a lot of material off. But with these solid steel crank arms, I probably have nothing to worry about. 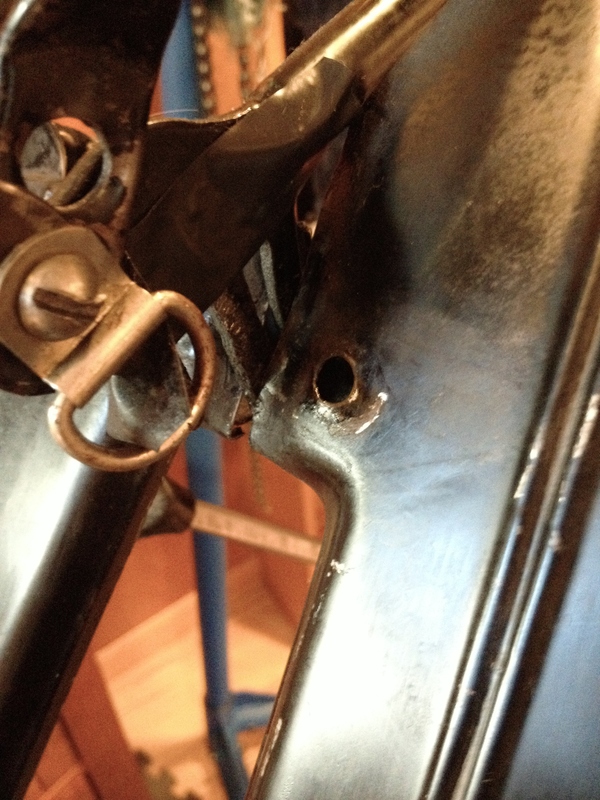 Ultimately, I was successful in adjusting the gearcase cover to eliminate any contact with the crank arm. Since I had the pedals off, I thought it might be time to overhaul them. Their last overhaul was 8 years ago. Sure enough, the grease was pretty dirty. Fortunately, the brilliant design of the cone and lock washer made the process incredibly quick and easy. The tabs on the back of the cone make it simple to adjust the cone to perfection. 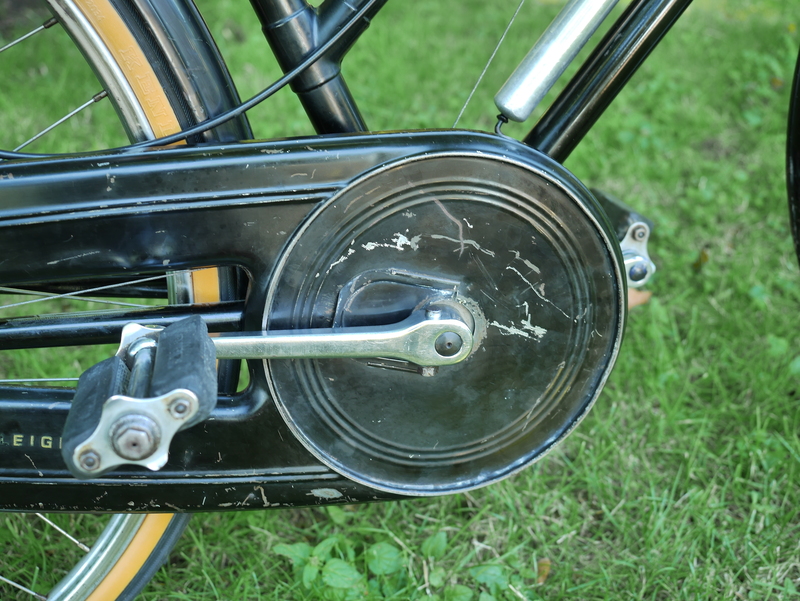 Once adjusted, the cone’s tabs lock into position with the grooves on the lock washer. 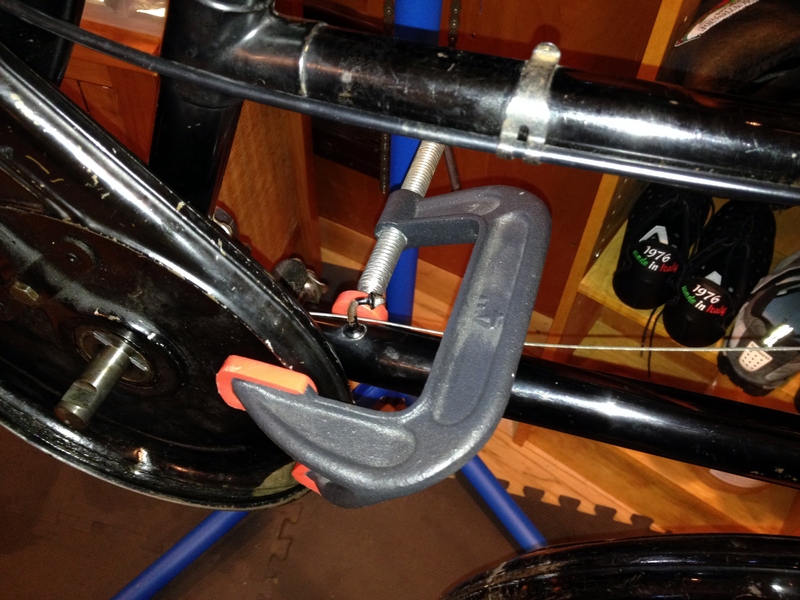 If your adjustment needs a tweak or two, just loosen the nut and move the cone one notch at a time. If only all pedals were designed this way! I headed out on the bike today and thoroughly enjoyed not only the new, silent drive train, but the amazing ride quality of this bike. The steel frame and steel wheels absorb road shock very well, so that even the upright riding position does not transmit pain waves to your spine. With the inertia of the heavy steel wheels, the bike really rolls once it gets going. In my high gear, I have even passed a carbon fiber bicycle or two, much to their riders’ surprise. 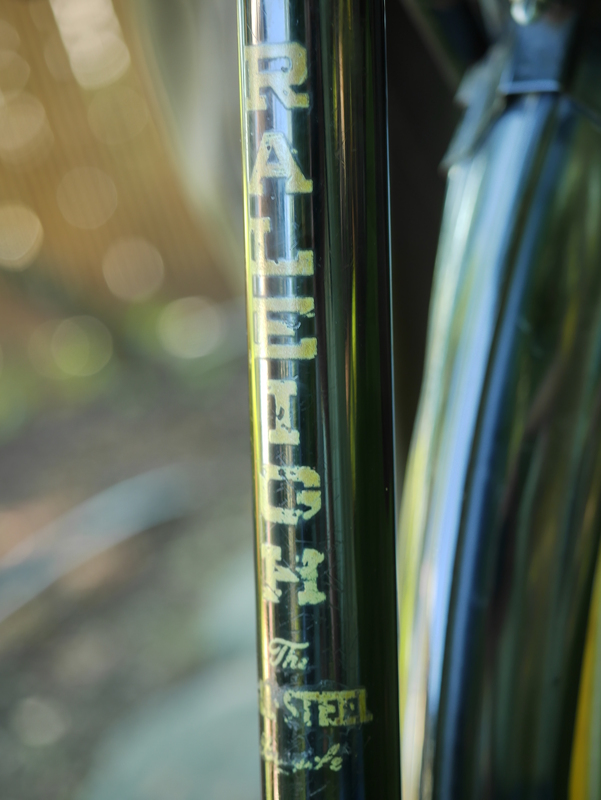 The components, the paint, and the attention to detail in every aspect of how this bike was manufactured puts modern quality control to shame. The bike responds to pedal strokes and never feels mushy or bogged down. The geometry is perfect for the type of bike it is, and it does not wobble at slow speeds and provides for fun descents and excellent cornering at high speeds. In fact, the ride quality of this bike is a sharp contrast to another 45 lb. machine I recently rode – the SoBi bicycles which are part of Pdx’s new Biketown bike share program. Those bikes are made with large diameter aluminum tubing, and also feature an upright riding position, although much more extreme than that of the Raleigh. The stiff aluminum frames, bad geometry and questionable component quality provide for a really unpleasant riding experience. 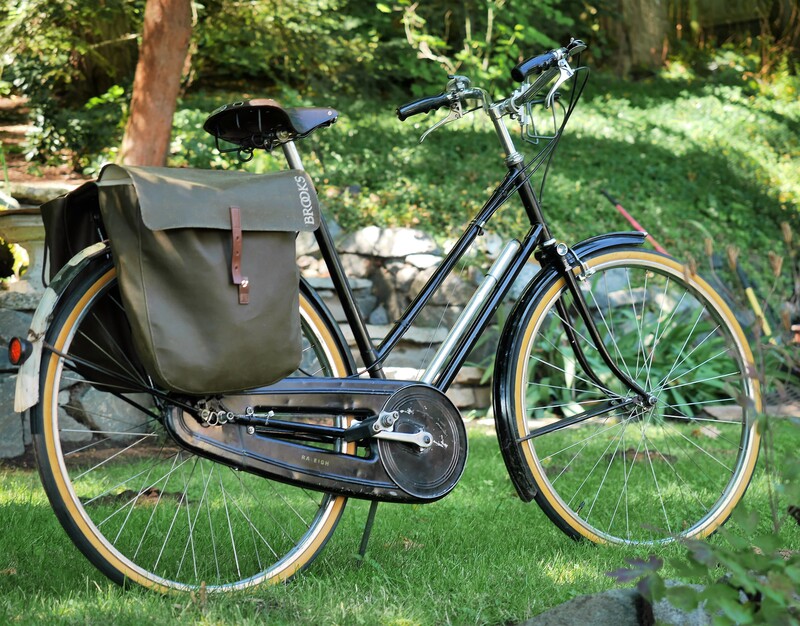 It would be fun to see a bike share program which used quality vintage bicycles and de-emphasized modern technology (which serves as a barrier to those who cannot afford the latest internet device) as a way to introduce new riders to urban commuting. 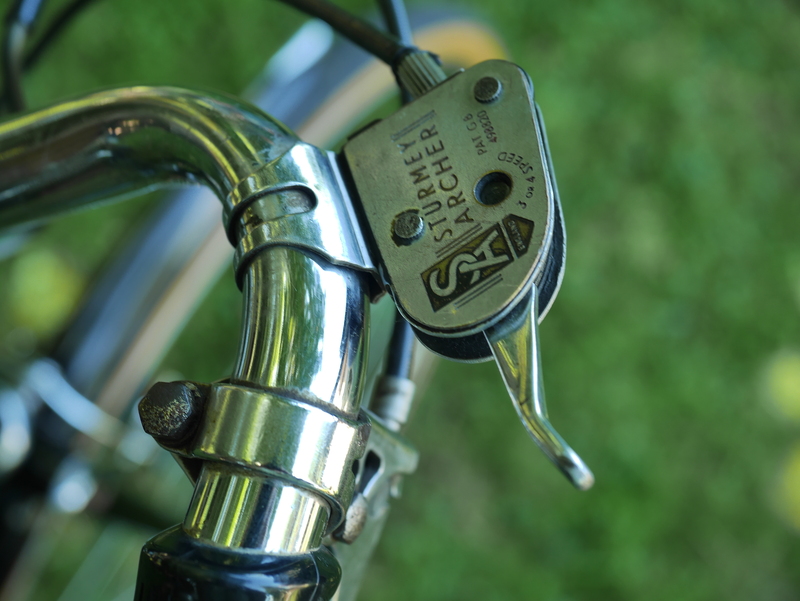 There are so many quality vintage bicycles out there. Find one and ride it! This entry was posted in bicycle frame geometry, Bicycle restoration, bike share, Raleigh bicycles, Raleigh Sports Tourist, town bike, Vintage bicycle, Vintage bicycle restoration, Vintage British Bicycle and tagged bicycle restoration, Brooks saddlebags, ladies bicycle, North Road handlebars, Raleigh bicycles, Raleigh Sports, Sturmey Archer, vintage bicycle by Nola Wilken. Bookmark the permalink. That looks like the ultimate ride. I would like to know what kind of bell that is and what type of tyres you use. What is the farthest you have ridden this Sports? Good work on the bash guard. The bell is a vintage Reich that I added – it dates to the 60’s I believe. I’ve taken a number of 20-30 mile rides on this bike, but I wouldn’t choose it for longer rides unless I was in some really flat terrain. Riding it is a great workout! 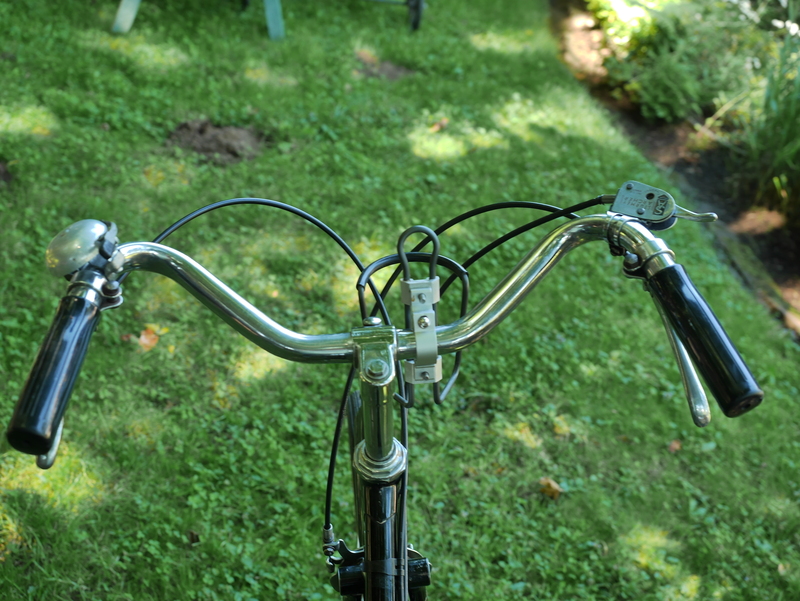 I have 2 vintage raleighs, a raleigh sports from 1974 and what might be considered a sprite that has a rear derailleur and 5 speeds, maybe from the 60’s. They have a wonderful ride quality despite the weight, or even because of the weight. Wonderful smooth handling and once they get going, wow! They roll! And I’ve passed roadies! I’ve taken the sprite which I call magenta(the colour) on very long rides. I see a lot of modern bikes trying to copy but there is no comparison. I put a 5 speed internal geared hub and drum brakes on the sports, which made the bike heavier than it had already been, but it was a splendid ride and I took it long distances in all weather commuting to work. I wish it had a chain case, but that might have added more weight. Now there are issues and nobody locally to help so it’s on a long holiday in the bike room with flat tire. Yet I could ride up some very very steep hills. The sprite went out of commission because the odd tire sized tires finally died I got some better tiny road bikes, but I am planning getting it back into action with 650b wheels because the brakes will reach and the frame is wide enough for those tires, but I will keep most of it original andintact. And yes, what was with the super high gearing on these raleigh? 52t chainrings! I love it, but visitors boring them certainly found it challenging. Hi Heather, I once had a 1970’s Raleigh Sprite – a 5 speed with a rear derailleur. It was actually quite a pleasant bike as well, and was fun to commute on for a while. It was quite “Spritely”. The 52 is in reference to the gear inch ratio, not the chainwheel. The gear inch range on this Raleigh, with its 48T front ring and 18T rear sprocket is 52-69-92. Quite high for a heavier bike and challenging on steep hills. A smaller rear cog could lower the gearing down, but I haven’t gotten around to changing it – I guess I kind of like the workout of riding it as configured!